Alloy chain slings were designed for overhead lifting and boast the best resistance to abrasion, cuts, and heat in comparison to all other types of slings. Alloy chain slings also feature high flexibility in combination with average elongation (up to 20% prior to failure) and shock resistance characteristics. Perhaps the most advantageous feature of an alloy chain sling is its ability to be repaired. Nearly all damaged components discovered during an inspection cab be repaired and restored to useful conditions. Alloy chain slings do however have the poorest strength to weight ratio in comparison to all other sling materials. 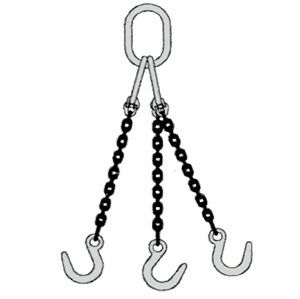 Our chain slings are available in many sizes and configurations from 7/32” – 1 ¼”. Horizon Cable can fabricate slings with grab hooks, sling hooks, foundry hooks, or self-locking hooks to name a few. We also have the capability to fabricate welded alloy chain slings upon request. NOTE: All chain slings will use grade 100 alloy chain & components unless otherwise specified. All slings include heavy duty engraved id tags in accordance with OSHA requirements. Welded Alloy Chain Slings Available Upon Request. We offer inspections and mobile proof test services for product verification, break testing, and load testing to ensure compliance for all alloy chain slings we sell and repair. Our mobile proof test services are available throughout the United States. In addition to our mobile load testing services we have stationary test beds to service Oklahoma, Texas, Kansas, Wyoming, North Dakota, New Mexico and all surrounding areas. Triple leg wire rope slings commonly have a mechanical splice / flemish eyes on the end of the body, and are constructed of 3 wire rope assemblies that are attached to an oblong master link. The lifting ends of the wire rope legs can be fitted with a variety of hooks, eyes, or rings to allow attachment to any object. These are designed to lift unbalanced loads. Wire rope slings are constructed of strong high quality steel that is resistant to corrosion, heat, sunlight, and most chemicals. Thimbles greatly improve sling longevity by protecting the wire rope at connection points. Our wire rope slings are custom built to meet your specific needs for any application. Fork Lift Beams are specifically designed to make fork lifts more versatile by providing positive handling of loads otherwise impractical for fork lifts.